I was cruising around some other blogs and stumbled across this ad for a South African gum company called Stimorol. Before I even get started on the actual ad I just have to say that it really blows my mind how much gum companies spend on advertising. Think about in the last 24hours of your life how many gum ads you've been exposed to and I can guess that its at least 2 or 3 TV spots, probably 1 or 2 Out of Home ads on your way to work and probably a couple of in-store ads. Whether its Stride trying to knock a piece of gum out of your mouth because of its everlasting flavour or 5 gum speaking to the intense refreshment you get from chewing a piece. Either way these gum are always active in market with their advertising efforts which can only lead me to assume that this is a cut throat industry to compete in and only the "freshest" ideas will survive. Of all the holidays to own Guiness chooses Halloween? 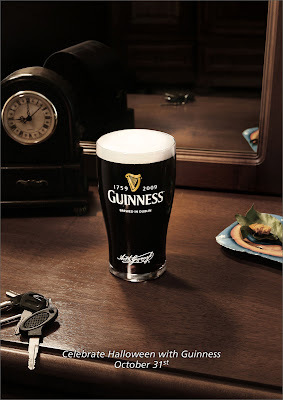 I have to commend the folks at Tempo Advertising for selling this strategy through to the folks at Guiness head office. While most beer brands choose summer partying, cottages, hockey, football and St. Patty's Day to align with Guiness has taken a run at Halloween and seems to have won the holiday uncontested. Guiness's run at owning Halloween started a few years ago and seems to have successfully aligned with the day (which just happens to be one of my favourite holidays). I think that this unconventional approach speaks volumes about the brand and its willingness to disassociate itself from the rest of the beer industry. Most recently this print ad just launched and should help continue to tighten Guiness's strangle hold on the Halloween season. I want to apologize for not including you in my post about HBO. I got so wrapped up in Entourage and True Blood that I completely forgot the joy you bring me through Dexter and Californication. Not only are you producing a quality tv show but your advertising over the past year or so has been outstanding. Most recently, I caught the YouTube based game called 'Where's Dexter'? The premise of the game is (not surprisingly) finding Dexter in an assortment of scenes/situations. While 'Where's Dexter' is not a huge stretch on the creative side using YouTube's click through technology, I still have to give it up to the folks who created and approved this off the beaten path tactic for a TV show. I can honestly say that I never played an online Grey's Anatomy Operation game or a YouTube 'Choose Your Own Adventure' for lost. Here's hoping that regular TV is taking note of what a creative promotion could do for a series premiere.